Can you count 5 dozen? It was a HOT day outside today and none of us could bear it any longer, even with the sprinkler going and the pool to lounge in. So, what else is there to do than to find something scrumptious to bake in the kitchen. We decided to make some homemade chocolate chip cookies. The kids helped me...well, at least they were the batter testers. I was so thankful for their help because if they didn't do it I would have had to. I know, tough job;) But then I always run into this problem. The chocolate chip bag clearly says "makes 5 dozen", but for some reason we never make it to 5 dozen. Mmmm, I love cookie dough! Here is the idea behind our Memory Meal. 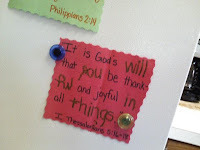 It is God's will that you be thankful and joyful in all things. 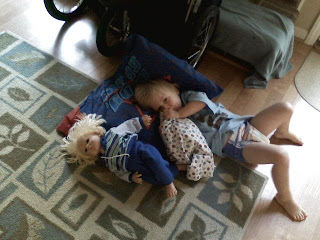 Zeke - Without even opening his eyes he scoops up "Baby Zeke", bubby and his pillow and heads to the living room to cuddle and wake up. 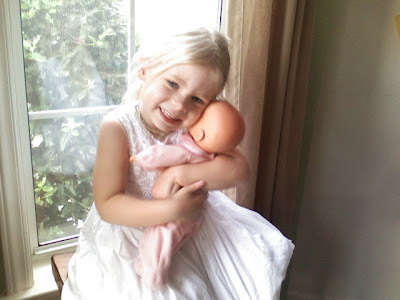 Areyna - Lifts her head off the pillow and says "Mommy, I'm ready to wear a dress today." 5- That white stuff that accumulates in the corner of a speaker's mouth after he's been preaching/teaching for a while...BLAH! Areyna was REALLY sad and upset after dropping Josh off at the airport this time. I think she's ready for this crazy summer to calm down a little. Anyway, after crying for several minutes she finally calmed down and looked up at me from the backseat and said, "Mommy, I just really need to go to CVS." That's right, she KNOWS that nothing feels better than snagging some good deals at the ol' CVS. It's way more fun than the bathtub and they still consider it playtime! I went a couple of dollars over but we needed milk. You'll notice it's even organic and I didn't hardly go over budget! The milk was the ONLY thing I didn't have a coupon for! If you haven't gone yet, go HERE to get a list of freebies or real cheap buy's! In case you can't see it: Dental floss, 2 yogurts, organic milk, frozen quesadillas, box of capri suns, 2 starbucks ice creams, Pert shampoo, Clearasil face wash, 2 bags of crutons, ketchup, peanut butter, toilet bowl cleaner, pretzels, cookies, 2 Trident gums, Tylenol and 2 hot dog packs. This Latin saying translated into Elglish means, "To work is to worship; to worship is to work." Colossians 3:17 - "Whatever you do in word or deed, do all in the name of the Lord Jesus." Romans 12:1 - "...I urge you to present your bodies as a living sacrifice, holy and pleasing to God; this is your spiritual worship." Our work can be exhausting, frustrating, discouraging, disappointing, beyond boring, and just plain hard sometimes. But in reality, our work is not our problem. Our problem is our perspective. So this is my prayer for you...for me, today: to do EVERYTHING as worship as unto the Lord. Taken from "Satisfy My Thirsty Soul"
Last time Josh had a ministry trip I planned themed meals every night to keep our day interesting and to look forward to something everyday. I would have LOVED to do that this time but with my lack of motivation and energy these days AND the fact that Josh will be gone 2 weeks I decided to do something different. So, here are the rules. After we bless the meal we say the verse together a couple of times before we dig in. Then, throughout the meal when I say "freeze", or if one of the kids gets the urge to say it=) we have to stop what we are doing and say the verse again, then throughout the rest of the evening we practice it off and on, concluding during our family devotion time before bed. The kids weren't too crazy about having to wait to eat dinner at first, but it didn't take them long to catch on. By the end of Josh's trip we should have a handful of verses about attitude and obedience down=) We are going to be gone a lot visiting friends and family but I thought we'd make good use out of our time we ARE at home. 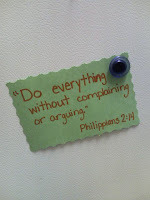 "Do everything without complaining or arguing." So, I have never been able to partake in Super Double Coupons at Harris Teeter before but I just spent my early morning getting my high-valued coupons in order so I can head out first thing tomorrow morning. I spent last weekend in Richmond, VA at the Homeschool Convention and many of you have asked me to post my conclusion of what I thought. So, as promised, here is my recap of the weekend. Josh was homeschooled from middle school-12th grade and I went to a Christian school from Pre-K - 7th grade and Public School from 8th-12th. We are putting our experiences together as we pray about and try to decide what is best for our kids and their educational needs as well as our lifestyle (traveling on the road so much). Since I had NO CLUE about homeschooling Josh and I thought it would be wise for me to attend the convention just to see what is out there and see if this is something God has called me (us) to do. I will admit that I was very overwhelmed with all the "stuff" that was out there and the feeling of inadequacy was overbearing, but as the weekend went on I began getting more and more relieved about all the options. The seminars that I chose were Great and I learned a lot in each one of them. All-in-all I came away with a better knowledge of what homeschooling is and what it isn't as well as knowing that not all families are the same and not one way works for everyone. That being said, whatever we choose to do is based solely on what we think is best for our family, not because we think there is only one way to do it. "You don't have to make a 12-year commitment. Try 1 year at a time." Ask yourself, "Am I willing to take responsibility for my child's education, sacrifice my time, make education a priority, reorganize my schedule and put my child's needs above my own?" You have to keep a balance between organization and flexibility. "Have a plan, but expect interruptions." Don't be afraid to make a mistake. You will mess up sometimes but that is part of learning. "You'll never be able to teach them everything they need to know. Just give them a love for learning." Allow everyday life to become learning experiences. "Children who wait until second or third grade to start formal academics usually catch up with their peers and often pass them. There will be less stress, better behavior and motivation, and fewer eye problems. Be sure you are not letting academics become your primary focus. I learned that I have more time than I thought. There is no reason to pressure myself to teach Areyna to master reading by the time she turns 5. If we choose to homeschool we can take it at her own pace. I realized that my kids have an advantage over most other kids their age...we travel for a living. Last weekend motivated me to find learning experiences while we are on the road seeing new things. In the state of NC we are not required to register our children as homeschooled until the age of 7. So, we will continue to seek out God's direction for our family as we make this decision but I do feel like I walked away with a better comprehension of the homeschool side of education. 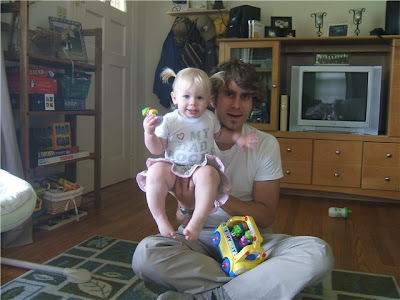 Just A Few Reasons Why I Picked This Man To Be My Baby's Daddy! 1- Josh gets Poison Ivy (or SOMETHING) every time he mows our yard! 2- It seems to get worse over the years. Josh and I had a bet going on a few weeks ago and of course I won! So, tonight he fulfilled his deed...he cleaned out the closet of death!!! This would be the closet that we put ALL of our music stuff in, including merchandise. Josh has also stored ALL of his school notes and papers in there from college and seminary, along with notebooks FULL of years of old songs and chord charts that he has written. Man, what a good feeling! So, with a clean and organized closet and a little decorating project which I accomplished today, the baby room is DONE! My friend Joy had a GREAT idea about covering cork board with cloth. Close-up...I don't know if I like the pictures on the squares or not. I was in bed last night, actually asleep this time, when I heard the kid's bedroom door open. Then I heard little feet patter down the hallway. Areyna was actually going to the bathroom at night all by herself without waking us up to tell us=) See, the kids have one of those childproof doorknobs on the inside of their room, mainly to keep Zeke contained, but Areyna has figured out how to open doors with them on. When she first started wearing big girl undies, and had yet to figure out the doorknob, we taught her to come and knock on the door if she had to go potty at nighttime and we'd let her out and help her. It got to the point, though, that even if we were in a 1-bedroom hotel room she wouldn't just go, she'd wake us up to tell us she had to go=) Last night she did it. I know, no big deal, right? But to a mom that's huge. It's right on up there with Areyna being able to fix her own drink from the refrigerator and then doing the same for her little brother. Now with a 3rd baby on the way I can't think of a better "good mommy" to have around than my precious Areyna. She is going to be such a big help. And she WANTS to be. We're all ready for him to get here. Just 7 more weeks! Can You Guess What I'm Doing Today? After being gone for so much this month our refrigerator and pantry are looking pretty bare. Actually that's an understatement. We are out of just about EVERYTHING. So, my project for today is restock our kitchen. And, just for you moms out there. 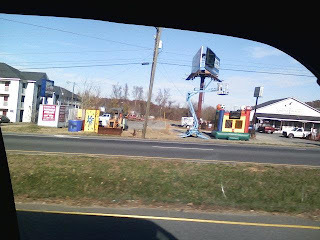 If you need pull-ups there is a pretty good deal going on this week. Buy 3 huggies pull-ups at $8.99 each and get a $5 Target gift card back. OOP $19.97 ($6.65/pack) - Then you can use the $5 gift card to get the 3 cereals that give you a FREE gallon of milk! You should have a coupon for all those cereals from the paper. Not too shabby=) If you have any Target coupons to stack that with you could really come out with a killer deal! We made it home last night. We had plans to do a few more things and head back today but my body (and emotional state) reached its limit and we headed on home after lunch. The kids have only been home for 1 day in the past 2 weeks. They have been great road warriors. We couldn't have asked for better kids for what we do=) I'm so proud of them. They were so exhausted that they were both asleep less than 10 minutes down the road last night. After a great balanced dinner of goldfish and cereal bars we made it home and as soon as we walked in the door the kids went right in their playroom and began re-discovering all their own toys and then outside to play in the sandbox until it got dark. It was like all of their toys were brand new since they hadn't seen them in a couple of weeks. I've been bragging on Josh and his new ability to pack and travel with the kids by himself. He did a GREAT job keeping everything together. We did have one surprise when we got home. Rainy had a cup of milk that sat out for the duration of our stay in Raleigh which looked like a cup of white paint but definitely didn't smell like it! 1- Apparently when you get out of your car at the hotel and say, "No, I can get my bags myself!!!" 3 times in a row it translates, "Please take my bags off of my shoulder and put them on your cart so I can leave you a hefty tip." 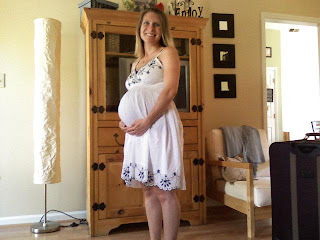 2- I must have a sign on me that says "I am overwhelmed, I'm new at this, I'm pregnant and obviously confused!" because every vender gave their 20 min. speech to me at their booths, whether I said I didn't have any questions or not. 3- Affordable meals means $12.99 buffet. 5- I have learned SO much about homeschooling. One thing being that NC is one of the easiest states to homeschool in. That's awesome, seeing as I have not clue as to what I'm doing if this is the route we choose. We made it home on Monday night to sleep in our own beds after a great weekend with Ingleside's youth in Myrtle Beach. I spent all yesterday trying to catch up in the office and Josh worked on demos for the next CD project we'll be working on next month. 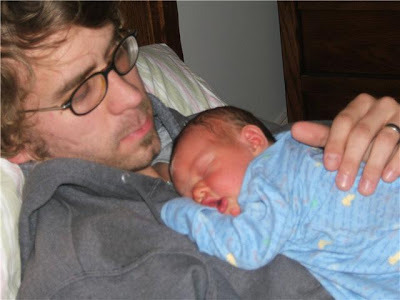 We did get a lot done, but we were aching to see our kids. I hadn't seen them since last Wednesday and it was time=) We got back in the car to head back here to Virginia to bring the sound equipment back and pick up the kids. Josh will be heading back home with the kids today but I am heading to Richmond for a Homeschool Convention before meeting back up with my sweet family in Raleigh this weekend at Journey. We decided it was time to get serious about our schooling plans since we only have 1 more year before Areyna starts Kindergarten. I'm anxious to see all that's out there. Especially since Areyna was only in a 2-day preschool class last year and it was difficult enough to get her to school 2 times a week with our travel schedule. So, it's hello...goodbye to my little kiddos for a few more days. Here are couple of good deals for ya'll. I found a new money-saving blog that just might save me even more money than before. It is SouthernSavers.com. It's kind of like the Grocery Game but it's FREE! Not only does it match up the sales with the Sunday paper coupons, it links to on-line coupons as well. It is a clean web page so it's easy to find what you need. You can go over to the right hand column and choose which store you want to search the deals for. She has freebies and giveaways as well! I like how she lists all the CVS deals and then at the bottom she tells us what she will be getting and what her scenario is. Anyway, go check her out and see if it will work for you. What other web pages do you use to help you find the BEST deals? I was asked to participate in a Blog Circuit for the review of Frank Viola's new book "From Eternity to Here". I must be honest, I haven't gotten all the way through this book. It's not my typical reading style dealing with potty training, parenting or saving money=) But I am going to finish it because I said I would. Basically, it is a book compiled of 3 parts: The Bride Of Christ, The House Of God and The Body Of Christ and The Family Of God. It is Viola's opinion of the purpose of Christ's bride. As with any book you should always do your own research backed up with Scripture to see how it coincides with what God says before you make any life-changes about what YOU think the Body of Christ's purpose is. Like Josh always says, "pick out the meat and spit out the bones". The following blogs are discussing this new release that just hit the May CBA Bestseller List. Some are posting Q & A with Frank; others are posting full reviews of the book. To read more reviews and order a copy at a 33% discount, go HERE. I've seen this idea on several blogs lately and I LOVE the idea. So, here's the idea. This is your chance to ask anything and everything from our family life to my couponing techniques to traveling with kids to my parenting philosophies to being married to Josh Via...you name it. Just leave your question in a comment below. So, ask away and I'll answer your questions throughout the summer. How fun! 1- TUMS continue to be my best friend. 2- 2 days in a row now I have woken up at 4:13am to go to the bathroom in the middle of the night. Random. 4- I begin my 2 week appointment rotation since I'm getting down to the last few weeks. I was out running some errands yesterday and you KNOW that one of the stores I had to go into was Target, by far one of my favorite stores! Oh yeah, back to Target. I don't even know why I was in the grocery isles but I had just happened to meander over to that area in the back of the store and they had the biggest clearance section EVER! I was SO excited. I usually don't buy things off of my list but our grocery budget isn't getting used that much the next couple of weeks since we're traveling so I decided I could use that money to stock some needed items in our pantry anyway. They had a 3-pack of Old Spice deoderant, which is the only kind that can hold up for Josh through a whole gig., for only $3. Minus my $1 off coupon. They had tons of cereals to choose from and we were down to 1 box so I bought 4. 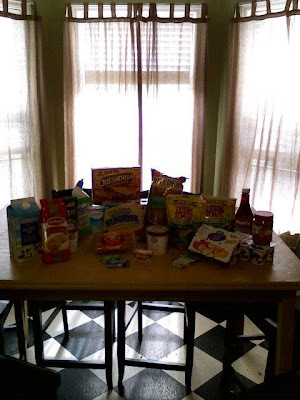 They had a 2-pack of Goldfish crackers (the big boxes) for $3 and other snack foods and granola/cereal bars. They had toothpaste and body wash and razors, but I'm pretty stocked up with that stuff from CVS. You name it, it was there. Here was my favorite find yesterday though...a HUGE BOX of Size 1 Pampers diapers (I'm talking 154 diapers ya'll) for a little over $10 off of the original price! I just went and added that to my stockpile for baby and was pretty excited since Pampers swaddlers are my favorite for newborn booties. They also had huggies boxes and pull-up boxes too! Just thought I'd pass that info. on to make sure you bring your coupons and check the clearance section in YOUR Target. I have a question for you before you go though. How can diapers expire? Why in the world would they mark a huge box of diapers down. What could possibly go "bad" in diapers and why would they want to get rid of such an essential item? Any ideas? We just got back on Monday late afternoon from a weekend in Raleigh, NC leading worship. We leave again on Friday to lead worship for a beach retreat, which I am totally STOKED about, by the way! But there are a few more things that need to get done before the retreat...like a trip to VA. We are dropping the kids off at Meme and Poppie's house and picking up all the sound equipment for the camp on Wednesday and coming directly home on Thursday so we can leave Friday for the retreat. That would mean 1 day at home! I am SO excited! Don't get me wrong, I absolutely LOVE my family and my kids, but when was the last time you were in your house all by YOURself? On the way to Raleigh this weekend Areyna and Zeke were passing the time finding pictures in the clouds. Areyna: "I see a pink heart cloud"
Zeke: "I see a poopie cloud!" ...and I'm about to have another boy?! I've literally paid pennies (if that) for! For some reason we run out of our ministry CD's AND Books at the same time and the more you buy the cheaper they are when we need to restock so we now have an office FULL of boxes, boxes and more boxes. If you know me at all you KNOW I despise boxes! I tried to take advantage of the few days I had at home because they seem to be so few and far between lately. I was ready to find a home for the boxes and I also wanted to feel like I'd accomplished something for baby #3 since he'll be here soon. Luckily those two things go together very well. If I pull out the pack-n-play (our version of a crib) from the kids closet and go ahead and set it up for the baby then I can store all the diapers and wipes that I've been stock piling over the last few months under the bassinet part of the bed instead of storing them in the closet. This would then make room for the endless stacks of boxes in our office, giving everything a home once again...ahhh. So, a couple of nights ago I had a task and nothing was gonna stop me=) I got the baby bed ready and started pulling out the diapers and wipes to store under the bassinet of the pack-n-play. This is when I realized that we have quite a stash of diapers and wipes, which I've paid only pennies for using coupons, CVS and Target deals, gift cards, and free samples that come in the mail! Now that the boxes have a home and the baby bed is up all I need to do is ask Josh to pull the 0-3 month baby clothes out of the attic and we'll be ready to go!